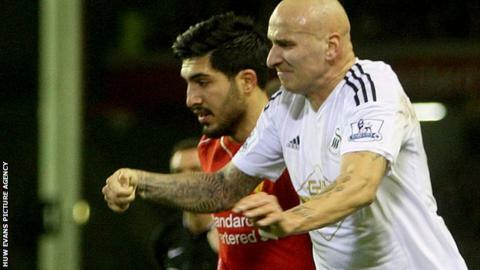 Swansea's Jonjo Shelvey has been banned for four games after the club opted to accept a charge of violent conduct by the Football Association. The midfielder caught Liverpool's Emre Can with his arm during Monday's 4-1 defeat at Anfield. The 22-year-old was not punished by referee Andre Marriner during the game. Swansea stood by Shelvey's claim any contact was unintentional, but the club "does not believe an appeal would prove positive for the club or player". Shelvey has been given a four-game suspension as an extra game has been added because he was sent off at Everton earlier in the season. The ban starts immediately and the midfielder will miss the New Year's Day fixture at Queens Park Rangers, Saturday's FA Cup game at Tranmere, plus two home Premier League games against West Ham United and Chelsea. Liverpool winger Raheem Sterling, 20, was not charged for an incident involving Swansea's Federico Fernandez. BBC Wales Sport understands Swansea are furious with Marriner's claim that he did not see the incident, which was caught on video. After the game, manager Garry Monk said: "The referee was perfectly placed and no-one had a better view than him of the incident." Shelvey, who was sent off against Everton in November, tweeted after the loss to say the contact was unintentional and that he apologised to German Can, 20.